The tutorial explains what a cell address is, how to make absolute and relative references in Excel, how to reference a cell in another sheet, and more. As simple as it seems, Excel cell reference confuses many users. How is a cell address defined in Excel? What is an absolute and relative reference and when each should be used? How to cross reference between different worksheets and files? In this tutorial, you will find answers to these and many more questions. What is a cell address in Excel? 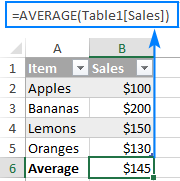 What is a range reference in Excel? What is a cell reference in Excel? A cell reference or cell address is a combination of a column letter and a row number that identifies a cell on a worksheet. For example, A1 refers to the cell at the intersection of column A and row 1; B2 refers to the second cell in column B, and so on. 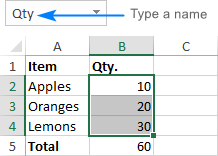 When used in a formula, cell references help Excel find the values the formula should calculate. For instance, to pull the value of A1 to another cell, you use this simple formula: =A1. In Microsoft Excel, a range is a block of two or more cells. A range reference is represented by the address of the upper left cell and the lower right cell separated with a colon. For example, the range A1:C2 includes 9 cells from A1 through C2. There exist two address styles in Excel: A1 and R1C1. A1 is the default style used most of the time. In this style, columns are defined by letters and rows by numbers, i.e. A1 designates a cell in column A, row 1. R1C1 is the style where both rows and columns are identified by numbers, i.e. R1C1 designates a cell in row 1, column 1. To switch from the default A1 style to R1C1, click File > Options > Formulas, and then uncheck the R1C1 reference style box. Type the equal sign (=). Click the cell you want to refer to. Type the rest of the formula and press the Enter key to complete it. To create a range reference, select a range of cells on the worksheet. To refer to the whole row or entire column, click the row number or the column letter, respectively. Click on the cell that contains the formula and press F2 to enter the Edit mode, or double-click the cell. This will highlight each cell/range referenced by the formula with a different color. Select the reference in the formula and type a new one. Select the reference in the formula, and then select another cell or range on the sheet. To include more or fewer cells in a reference, drag the color-coded border of the cell or range. To refer to cells in another worksheet or a different Excel file, you must identify not only the target cell(s), but also the sheet and workbook where the cells are located. This can be done by using so-called external cell reference. To refer to a cell or a range of cells in another worksheet, type the name of the target worksheet followed by an exclamation point (!) before the cell or range address. Start typing a formula in a cell. Click the sheet tab you want to cross-reference and select the cell or range of cells. Finish typing your formula and press Enter. For more information, please see How to reference cell in another worksheet in Excel. If the file or sheet name contains non-alphabetical characters, be sure to enclose the path in single quotation marks, e.g. As with a reference to another sheet, you don't have to type the path manually. A faster way is to switch to the other workbook and select a cell or a range of cells there. For the detailed guidance, please see How to reference cell in another workbook. There are three types of cell references in Excel: relative, absolute and mixed. When writing a formula for a single cell, you can go with any type. But if you intend to copy your formula to other cells, it is important that you use an appropriate address type because relative and absolute cell references behave differently when filled to other cells. A relative reference is the one without the $ sign in the row and column coordinates, like A1 or A1:B10. By default, all cell addresses in Excel are relative. When moved or copied across multiple cells, relative references change based on the relative position of rows and columns. So, if you want to repeat the same calculation across several columns or rows, you need to use relative cell references. For example, to multiply numbers in column A by 5, you enter this formula in B2: =A2*5. 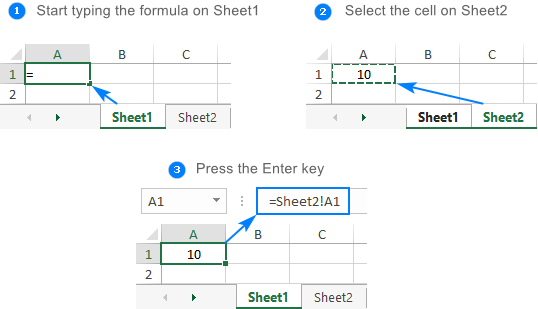 When copied from row 2 to row 3, the formula will change to =A3*5. For more information, please see Relative reference in Excel. An absolute reference is the one with the dollar sign ($) in the row or column coordinates, like $A$1 or $A$1:$B$10. An absolute cell reference remains unchanged when filling other cells with the same formula. Absolute addresses are especially useful when you want to perform multiple calculations with a value in a specific cell or when you need to copy a formula to other cells without changing references. More details can be found in Absolute reference in Excel. A mixed reference contains one relative and one absolute coordinate, like $A1 or A$1. There may be many situations when only one coordinate, column or row, should be fixed. In $A3, you lock the column coordinate because the formula should always multiply the original numbers in column A. The row coordinate is relative since it needs to change for other rows. In B$2, you lock the row coordinate to tell Excel always to pick the multiplier in row 2. The column coordinate is relative because the multipliers are in 3 different columns and the formula should adjust accordingly. For real-life formula examples, please check out Mixed cell references in Excel. Double-click the cell that contains the formula. Select the reference you want to change. Press F4 to toggle between the four reference types. Repeatedly hitting the F4 key switches the references in this order: A1 > $A$1 > A$1 > $A1. In simple terms, a circular reference is the one that refers back to its own cell, directly or indirectly. In most situations, circular references are a source of trouble and you should avoid using them whenever possible. In some rare case, however, they could be the only possible solution for a specific task. The following tutorial explains how to find and remove circular references in Excel. 3-D reference refers to the same cell or range of cells on multiple worksheets. Click the tab of the first sheet to be included in the 3d reference. Hold the Shift key and click the tab of the last sheet. Select the cell or range of cells to be calculated. Finish typing the formula and press the Enter key to complete it. For more details, please see 3D reference in Excel. Structured reference is a special term for including table and column names in a formula instead of cells addresses. Such references can only be used for referring to cells in Excel tables. For more information, please see Structured refereces in Excel. An individual cell or a range of cells in Excel can also be defined by name. For this, you simply select a cell(s), type a name into the Name Box, and press the Enter key. Select the cells with the formulas in which you wish to change cell references to names. 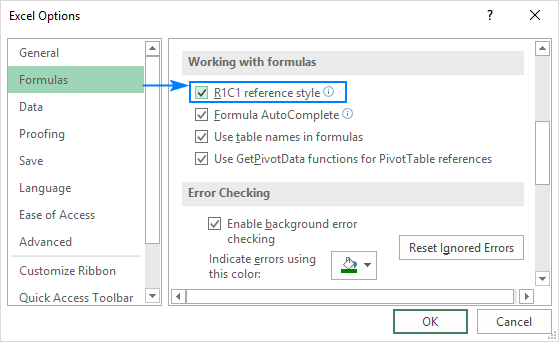 To replace the references with defined names in all formulas on the active sheet, select any single blank cell. In the Apply Names dialog box, select one or more names, and click OK. 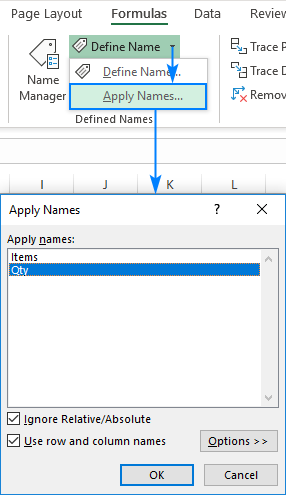 The detailed information on Excel names can be found in How to create and use a named range in Excel. That's how you work with cell references in Excel. I thank you for reading and hope to see you on our blog next week!